Supports premium GSD™ sonar module and GCV™ scanning sonar module. Advanced sailing and sail racing features. Garmin Marine Network and NMEA 2000 Support: Full-network compatibility allows you to add more to your boat. GPSMAP 7416 supports radar, autopilot, instruments, multiple screens, FUSION-Link, sensors, remote sonar modules, digital switching, thermal cameras, GRID™ and more. Add Array or Dome Radar: You can add your choice of Garmin marine radar, including our powerful xHD2 open array radars or xHD dome radars that pair ease of use with advanced open array features. Network Sharing: GPSMAP 7416 allows you to share features with other compatible GPSMAP units, such as radar, supplemental maps and user data, including waypoints, routes and tracks. User data entered into 1 chartplotter can be automatically synced with other chartplotters in a network. Heading, Position Refreshed 10 Times per Second: Fast, responsive 10 Hz GPS/GLONASS refreshes your position and heading 10 times each second to make your movement on the screen more fluid. It makes dropping up to 5,000 accurate waypoints and finding your way back them quick and easy. Special Sailing Features: Supported sailing features include laylines, enhanced wind rose, heading and course-over-ground lines, true wind data fields and tide/current/time slider. Racing features include pre-race guidance, synchronized race timer, virtual starting line, time to burn and lay line data fields. Gauge displays are designed to provide important need-to-know information at a glance, including true and apparent wind angle, set and drift, true or apparent wind speed, horizontal or vertical graphs, and a data bar with customizable data fields. Upgrade with our Best Maps on the Water: Two SD™ card slots provide expandable memory for accessory map purchases such as, LakeVü™ HD, LakeVü HD Ultra or BlueChart® g2 or BlueChart g2 Vision®. GND™ 10 Black Box Interface: The GND 10 black box interface seamlessly integrates Nexus instruments and sensors with the Garmin family. It converts data between the Nexus network and NMEA 2000 to provide trouble-free compatibility between Nexus and Garmin products, including gWind™ and gWind Race transducers. Compatible with gWind Transducers: gWind, gWind Wireless and gWind Race transducers feature twin-fin technology with 3-bladed propeller. 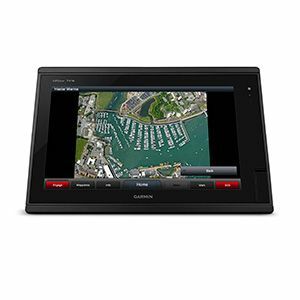 Connect to the NMEA 2000 and compatible Garmin chartplotters via the GND 10 black box bridge. Panoptix Forward Transducer: One Panoptix Forward transducer provides 2 impressive views, even while your boat is stationary. It shows the bottom plus fish and bait swimming in the water column in front of your boat – in real time. You can even see your lure as you reel it in. You can also get 3-D views of fish and structure in front of your boat. Multiple Depth Range Shading: Designate up to 10 different depth ranges each with its own color. Makes it easier to view target depths at a glance.​Commission Autopilot from ChartplotterTo make commissioning easier and more convenient, you can handle the entire autopilot commissioning process from your chartplotter screen.